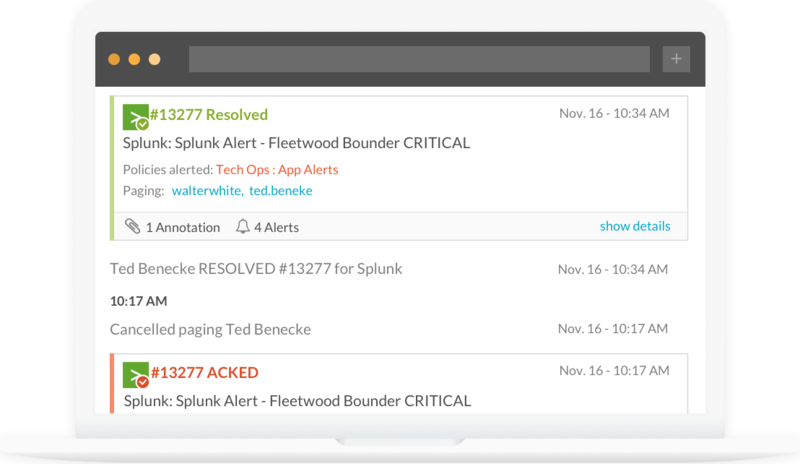 See VictorOps + Splunk in Action: Learn More. Set up teams, rotations, and escalation policies. Easily choose contact methods, see active users, and override schedules. Silence unactionable alerts, classify by severity, append remediation information, and reduce on-call burnout. Route incoming support or customer calls to the right responders, enabling person-to-person incident management. Capture actions with the Post-Incident Review. Leverage out-of-the-box reports to gain insights into MTTR reduction. VictorOps API calls and webhooks extend platform data into other systems, enhancing functionality and flexibility. VictorOps integrates with chat tools to support and capture team collaboration for timely response, remediation, and automation. Native VictorOps mobile for iOS and Android provides full incident management functionality without opening your desktop. Append alerts with relevant information, arming teams with incident-related runbooks, graphs, and documentation. Integrate your DevOps toolchain to understand the who, what, when, where, and why of code deployment issues.